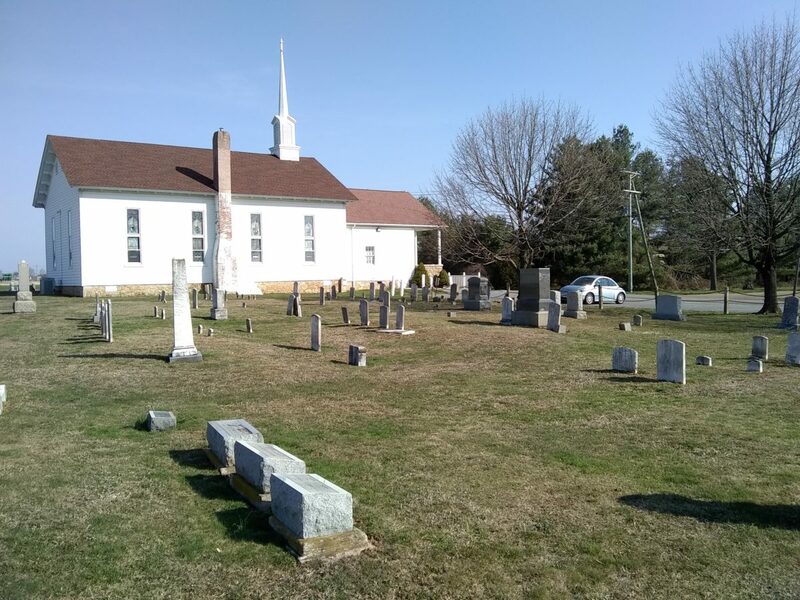 On April 14, 2018 I went to Cecil County and explored four cemeteries, looking for graves I knew about and graves I didn’t. I had been planning this for about two months, and you never know what you’ll find until you go and look. The roots of my dad’s family come from what I jokingly call “the borderlands between Maryland and Pennsylvania” — ie., Cecil and Chester Counties — as ancestors, Gibsons and Browns, Reynolds and Russells, go back and forth across the Mason-Dixon Line for two hundred years. 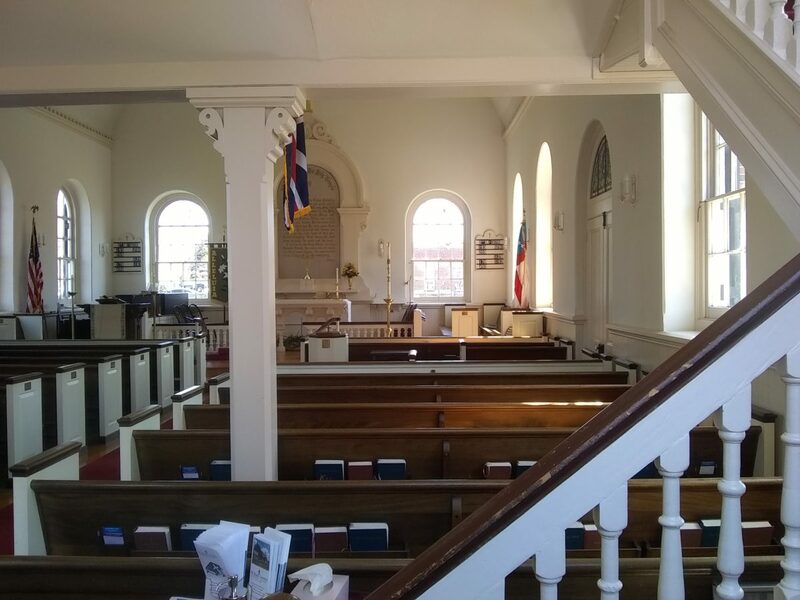 Some lore indicates family arrived in Cecil County from Scotland after the War of 1812 or before the American Revolution, other records indicate early settlers of Pennsylvania that moved westward and southward. The truth is that I don’t know a lot about my ancestors, which is why researching my ancestry is so fascinating. As an historical aside, the border between the two colonies wasn’t a joking matter; the land grants overlapped, Maryland’s charter granted it lands to north of modern day Philadelphia, Pennsylvania’s charter granted it lands to the northern end of the Chesapeake, and the two colonies fought a strange border war known as Cresap’s War or the Conjocular War, until it was finally resolved by the drawing of the Mason-Dixon Line. Ebenezer United Methodist Church in Rising Sun was the first of the four cemeteries I visited. 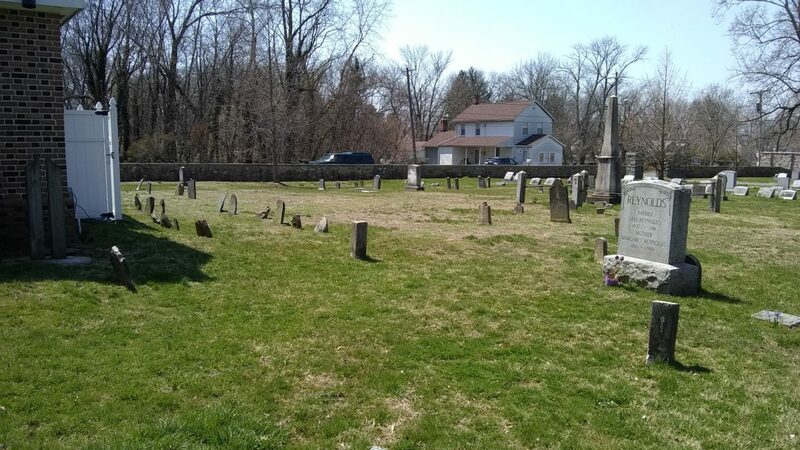 This is where my great-great-grandparents, Alexander and Albina (Brown) Gibson, are buried. Alexander’s middle name was Craig. Based on headstones at Principio Methodist in Perryville, I have begun to wonder if Craig may be a family name of one of his ancestors. Also buried at Ebenezer are William and Lydia Mary (Hambleton or Hamilton) Gibson and six of their children. William was Alexander’s younger brother. Their parents, Hugh and Mary Eliza (Gillespie) Gibson, had a number of children; of them, I think my favorite name is that of their daughter Minerva, named presumably after the Roman goddess of strategy and tactics. William and Mary (she apparently went by her middle name) had seventeen children. Two of the children (one of them buried here) were twins, so Mary was pregnant sixteen times. That’s twelve years of her life, pregnant. That’s a staggering amount of time, seventeen percent of her life. Not all of William and Mary’s children died in childhood, and two of them that reached adulthood are also buried here, their daughter Wilhelmina and their son James. While I was unable to locate Wilhelmina’s grave, James and his family have prominent markers along Ebenezer Church Road. I was struck by how small the church cemetery plot was. I didn’t know what I expected. 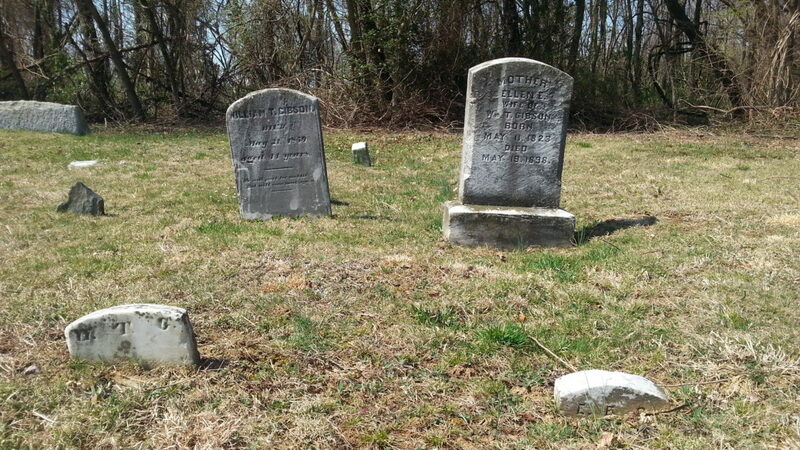 To the south side of the church, where my great-great-grandparents are, the headstones were older. Some were worn away and almost unreadable. To the north, the headstones were much newer, and most were from the last forty years or so. 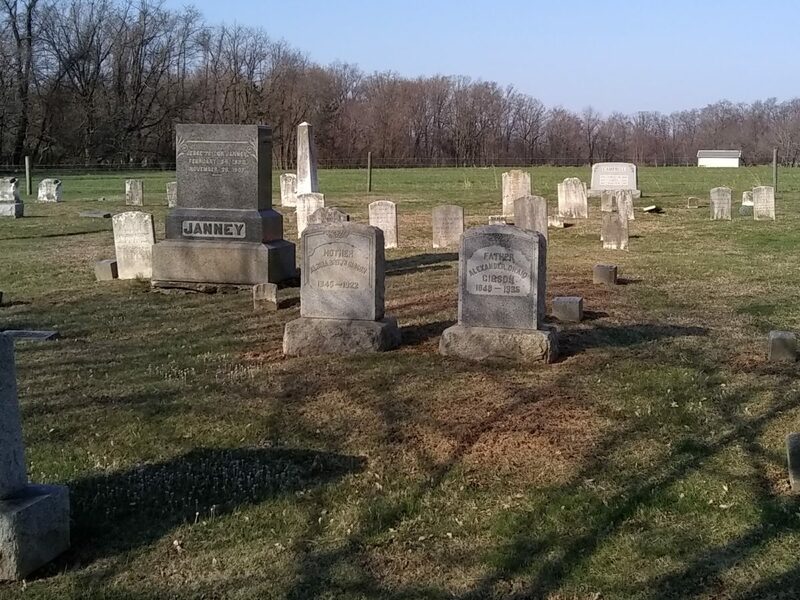 For more photos from Ebenezer, check out my Facebook photo album: Cemetery Explorations in Cecil County: Ebenezer. The second cemtery I visited was at Hopewell United Methodist Church in Port Deposit. My grandfather and his parents are buried here, as well as brothers and sisters and nieces and nephews of my great-grandfather. 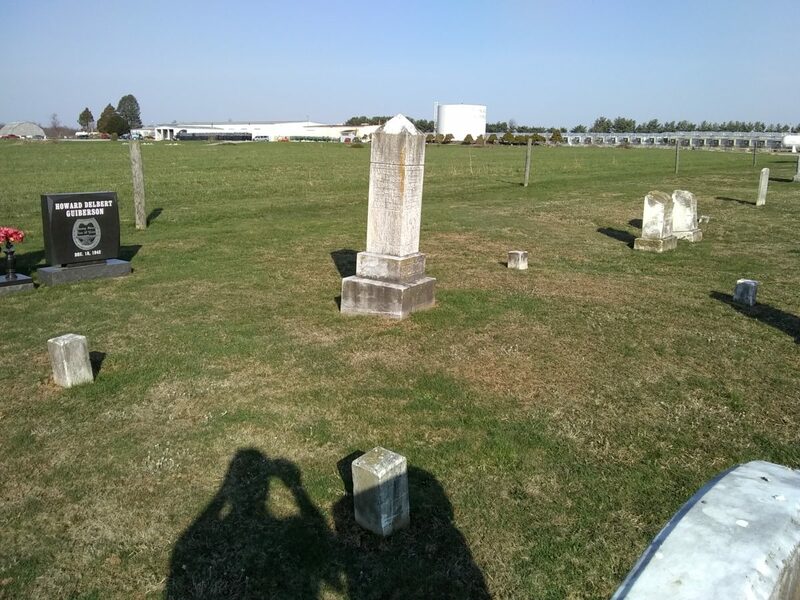 Of the four cemeteries I visited, Hopewell was the largest. It was also the only one of the four for which I had a map before arriving, though the map was heavily stylized and did not conform at all to the geography on the ground. At least, though, it marked out the sections; I had locations for people, and without those and the map I could have wandered all day. Hopewell was old as the age, styling, and weathering of headstones would attest, but it was also an active cemetery in that there were fresh graves and graves from last year that had not yet regrown grass. 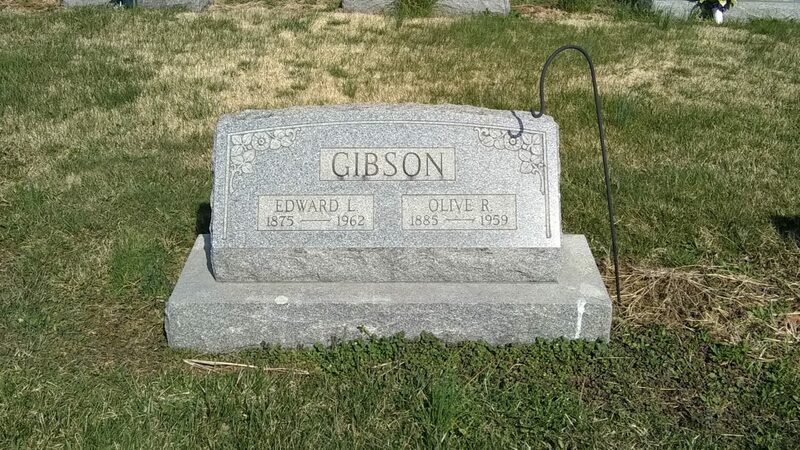 My great-grandparents Edward and Olive (Russell) Gibson. At the foot of their graves is a stone, flush with the ground, for my grandfather, David Gibson. He was cremated, and his ashes were interred at his parents’ feet. I can’t say that I really knew him. I spent time with him over the years. I received birthday cards from him. He paid us visits here and there, such as the time he came to visit in December before Christmas unexpectedly, stayed for a week, and departed one day. I managed to find everyone at Hopewell that I went in search of, including, surprisingly, the grandparents of a friend of mine who has an obscure last name. (I noticed the name in the cemetery records, sent him an email and asked, “By any chance…?”, and it turned out that was his grandparents.) I could see, as I walked the grounds, the way the cemetery had developed. The oldest graves were, of course, the ones closest to the church, and looking at the way the headstone styles changed I could see that the cemetery expanded in one direction, out toward the woods behind the church, and then grew in another direction, along the road. There were more elaborate stones here than at the others; there were obelisks and crypts, long elevated slabs and marble blocks, even two mausoleums. I could have spent more time here, but I had a schedule to keep. For more photos from Hopewell, check out my Facebook photo album: Cemetery Explorations in Cecil County: Hopewell. 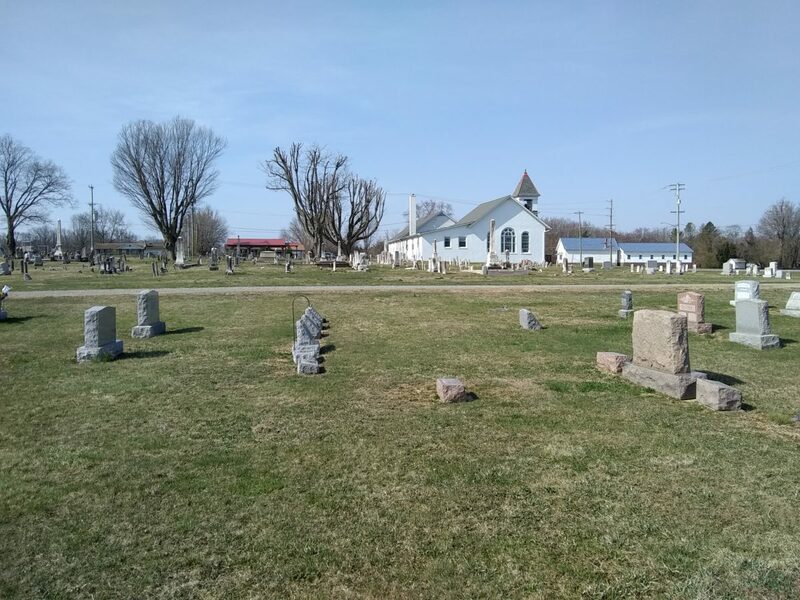 Principio United Methodist Church in Perryville was my third cemetery to visit. My grandmother Helen (Brown) Gibson, and her parents, Charles Benjamin Harrison Brown and Ethel Matilda (Reynolds) Brown are buried here. Charles Brown’s family came from Pennsylvania; his parents are buried in Little Britain in Lancaster County. I’ve seen a photograph of Charles when he was a child (late 1890s), with his siblings and parents outside of what I would presume was their farmhouse. His parents were obviously Republicans; in addition to Charles’ wonderfully 19th-century double middle name after the president at the time he was born, he had a younger brother named Theodore Roosevelt Brown. As I understand it, he was struck and killed by a train. Of my great-grandmother Ethel, I know nothing beyond her parents. My great-great-grandfather whom I visited at Ebenezer was named Alexander Craig Gibson. His father was named Hugh Boyd Gibson. His location is unknown. (I know of a Hugh Boyd Gibson buried in Havre de Grace, but that’s a grandson though Hugh’s son James.) I had made the assumption that “Craig” and “Boyd” were simply middle names of little to no import. I could not tell you, for instance, why my great-grandfather Allyn Gardner had the middle name of “Atworth”; it seems quite random to me, and the people who made that decision have both been dead for well over a century. Graves at Principio are making me reconsider my working assumptions, as there are a number of Craigs and Boyds buried here, especially in this old section closest to the rear of the church. 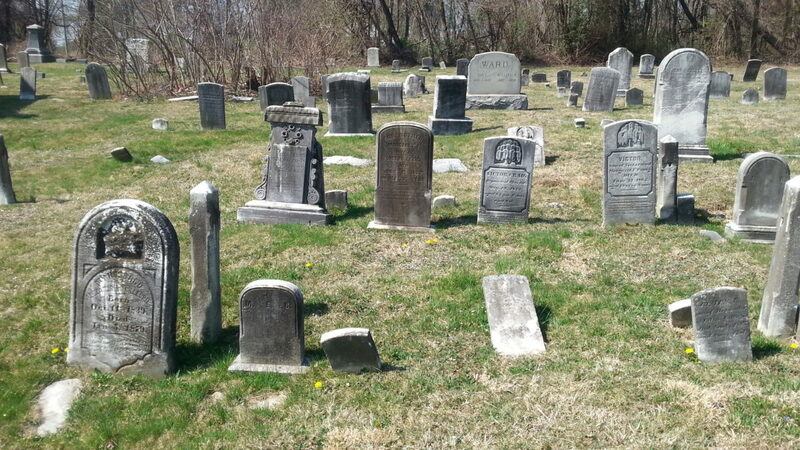 The row of headstones in the middle is a row of Craigs. “Craig” may indicate that there was a Craig in Alexander’s ancestry. “Boyd” may likewise indicate the same for Hugh. I was also intrigued by the carvings on some of the old headstones. A number had what looked to be a carved willow tree that towered over a coffin? a grave? I wasn’t really sure. (Examples in this photo are center right, Victor Craig and his son Victor.) I found headstones of the same style at Hopewell, and they were among the oldest graves and the ones closest to the church there. There are also a number of Gillespies here, and Hugh Gibson’s wife was a Gillespie, Mary Eliza (or Elizabeth) Gillespie. This is Hugh Boyd and his wife Margaret. I wasn’t sure where their graves actually were, as their headstones were leaning against the headstone for J. Henry Boyd. 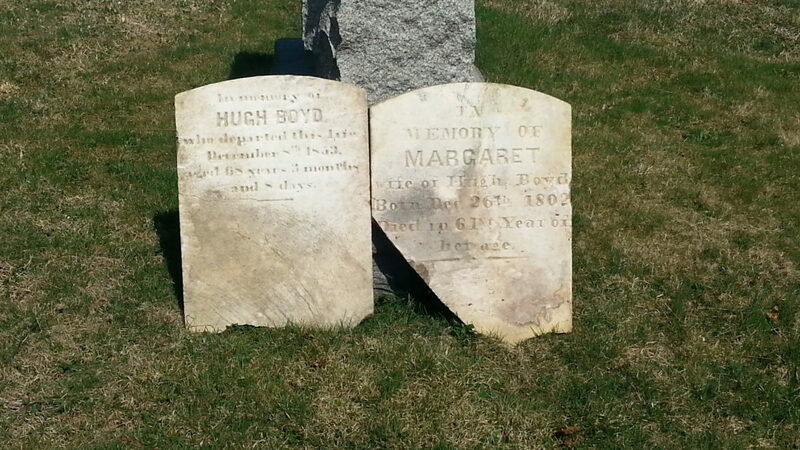 Hugh Boyd was born either August 31 or September 1, 1785 — I love headstones that require one to use math — and Margaret was born December 26, 1802 and died sometime in 1862 or 1863. J. Henry could possibly be their child, but as he was born in 1848, Margaret would have been 44 or 45 when he was conceived and at the upper limit of her childbearing years. Relatives of Hugh Boyd Gibson? There are plausible scenarios I can construct in my mind, cousin or uncle, too young to be a grandfather, but I have no idea. The coincidence of names can easily lead one to see patterns in the chaos where there are none. There are also two Gibsons here, William Gibson (1815-1859) and his wife, Ellen (1823-1898), but I have no idea if they are relatives or not. I know nothing of Hugh Boyd Gibson’s ancestry — parents, siblings, anything — and William T. Gibson would be a few years older than Hugh Boyd Gibson. For more photos from Principio, check out my Facebook photo album: Cemetery Explorations in Cecil County: Principio. The last cemetery on my itinerary, the fourth, was North East’s St. Mary Anne’s Episcopal. 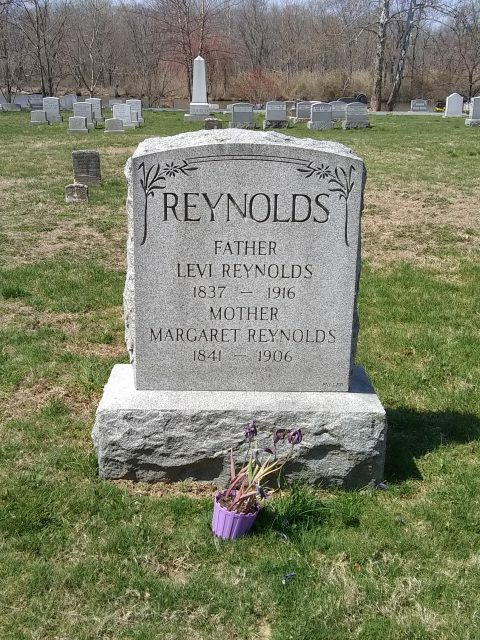 Ethel Matilda (Reynolds) Brown’s parents are buried here, William and Alfonsa (Howell) Reynolds, as well as William’s parents, Levi and Margaret (Reynolds) Reynolds. Of the four cemeteries I visited, St. Mary Anne’s was both the oldest and the loveliest. Oldest, because some of the headstones dated back to the 1730s. Loveliest, because the cemetery backed up against the North East River, and as I wandered the grounds on this lovely spring day it was quite serene and peaceful. The grave of my great-great-great-grandparents Levi and Margaret Reynolds. Levi originally came from Virginia (according to his death certificate), but his parentage in unclear. He moved to Pennsylvania before the Civil War, and married Margaret in Oxford, Pennsylvania in 1860. After the war, he and his family relocated to North East and he worked for the McCullough Iron Company. This grave was remarkably easy to find. One need only walk between the chapel and the vestry house behind it, then turn to the left and there, standing quite tall and prominently, is their headstone. To my eyes, it looks to be far more recent than early-20th-century. I suspect this is not the original headstone. It looks far too modern. I have no idea who left Levi and Margaret flowers recently. 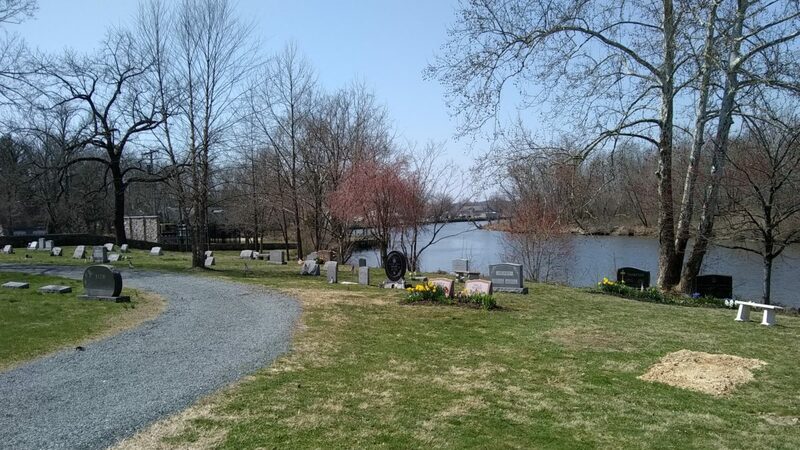 Their son and my great-great-grandfather, William Reynolds, and his wife, Alfonsa (Howell), are also buried here at St. Mary Anne’s, but they appear not to be marked. To the left of the Reynolds headstone is a simple slab headstone with the initials “J.A.R.” carved into it. To the right is a ground-level slab for Robert Reynolds, the son of Levi and Margaret, who was a mailman in the area. I suspect that William and Alfonsa are probably nearby. 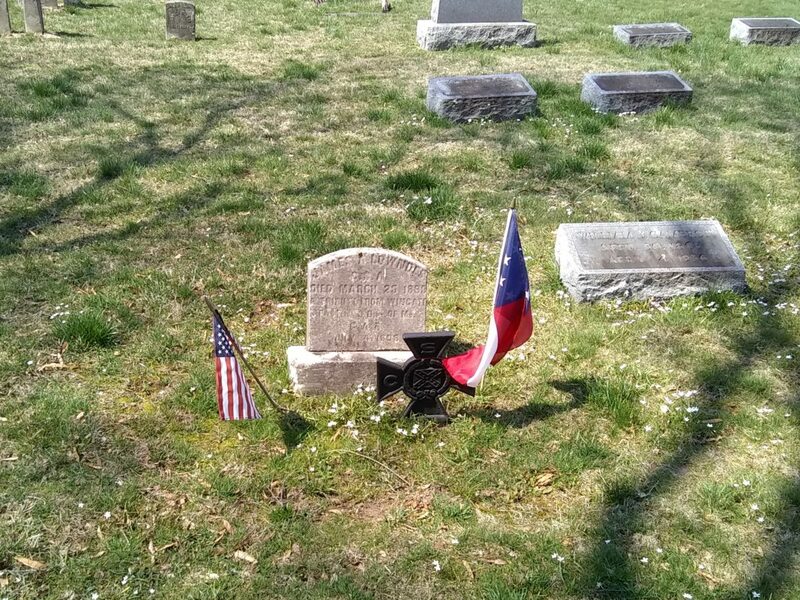 Near the Reynolds’ grave was a grave adorned with the Stars and Bars. This belongs to Private James Lowndes. St. Mary Anne’s had some truly old graves. Behind the vestry house, near the Reyonds headstone, were rows of graves that were nothing more than slabs of rock. Some had initials or dates chiseled into them. Most did not. Some headstones dated back to the 1730s. These two have been obliterated by time. 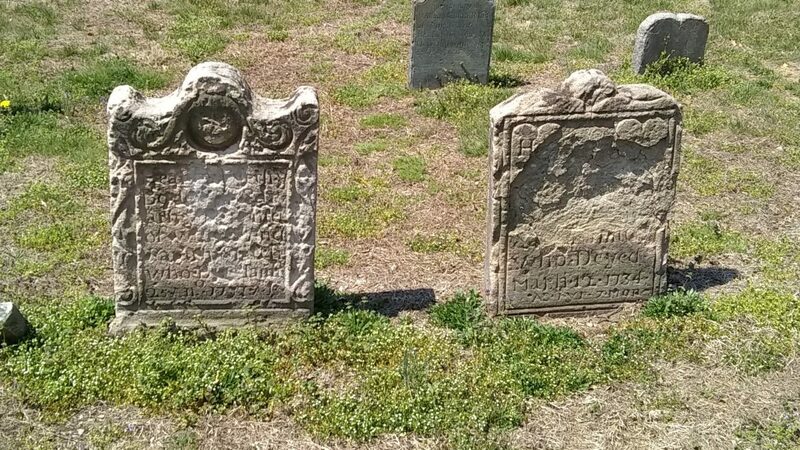 The one clear date is on the stone to the right; all I can make out is “Deyed March 12 1734.” The headstone to the left may have a date on it of “1737” at the bottom. Or it may not. The carving on the oldest headstones, those from the 18th- and early 19th-centuries, featured antiquated script and spellings, such as “Aprile” instead of “April,” the superscript “t” as a suffix in place of “-ed,” and the long S (which, to modern eyes, looks like an f without the crossbar). Wandering the grounds, I could feel the history there, and I couldn’t help but put my phone to the chapel’s windows to snap a few pictures of the interior. I wouldn’t have expected to see a pre-1801 Union Jack (a version without the St. David’s Cross representing Ireland), but the little of the history of the church that I know gives it some sense. There is no “St. Mary Anne.” The parish was originally named St. Mary’s, and when Queen Anne died she bequeathed the church a bible, a Book of Common Prayer, and a silver chalice set. In her honor, her name was added to the church’s name, hence, St. Mary Anne’s, and a Union Jack in her honor makes sense. For more photos from St. Mary Anne’s, check out my Facebook photo album: Cemetery Explorations in Cecil County: St. Mary Anne’s Episcopal. When I made my plans, I could not have chosen a better day to explore cemeteries. In some ways, everything that followed was anti-climax. 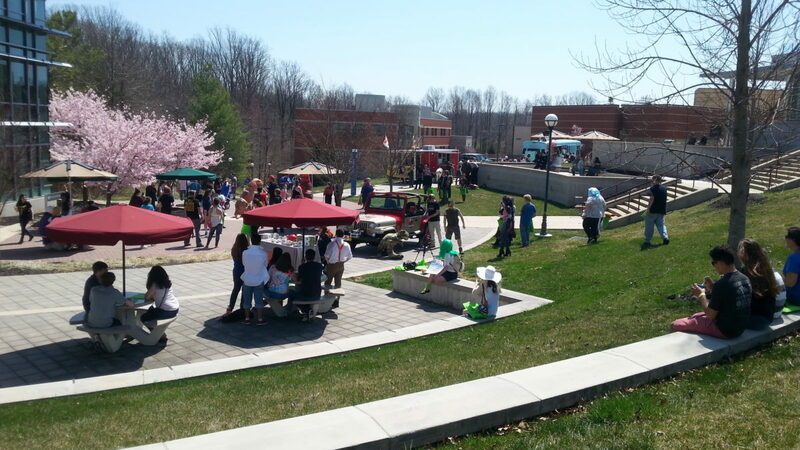 I went to Cecil Con, a comic book and media convention at Cecil College. For what it was, it was fine. I capped my day of exploring cemeteries in Cecil County with a baseball game in Wilmington, Delaware. 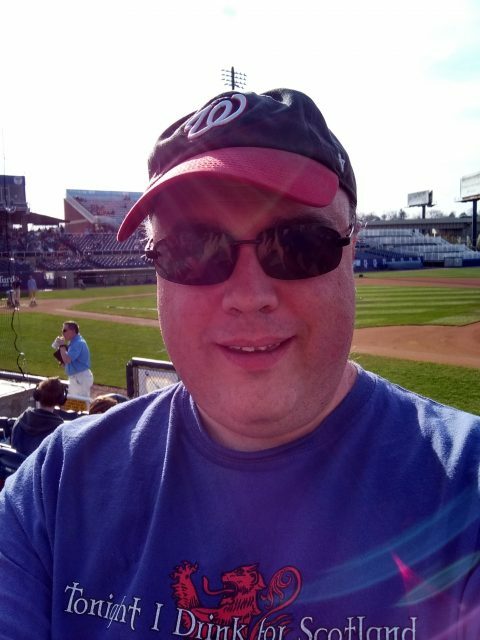 I don’t know how many times I’ve been past Daniel S. Frawley Stadium on I-95, but I’d never been to a game there, and since I was in the area and it was a nice day it seemed like a good thing to do. The Wilmington Blue Rocks played the Lynchburg Hillcats. The Hillcats were winning… and then they lost. Like pretty much every Carolina League baseball stadium I’ve been to, the outfield wall is nothing but advertisements. 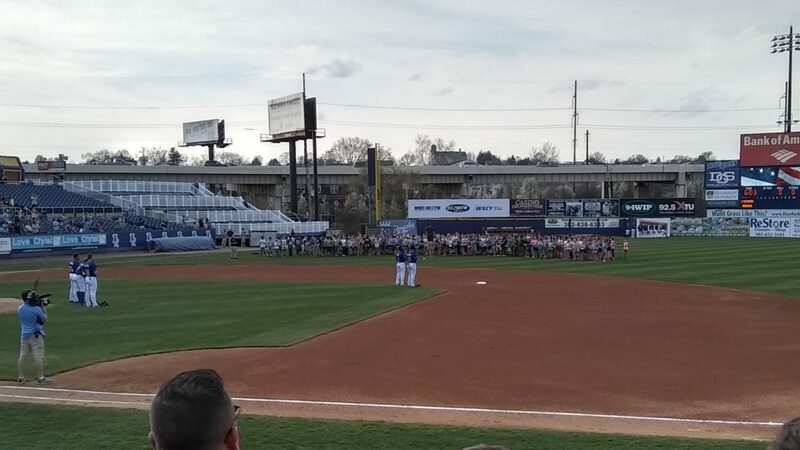 However, the ads at Frawley weren’t too overwhelming (a real problem in Frederick, imho), and the upper row was actually set back from the outfield wall. 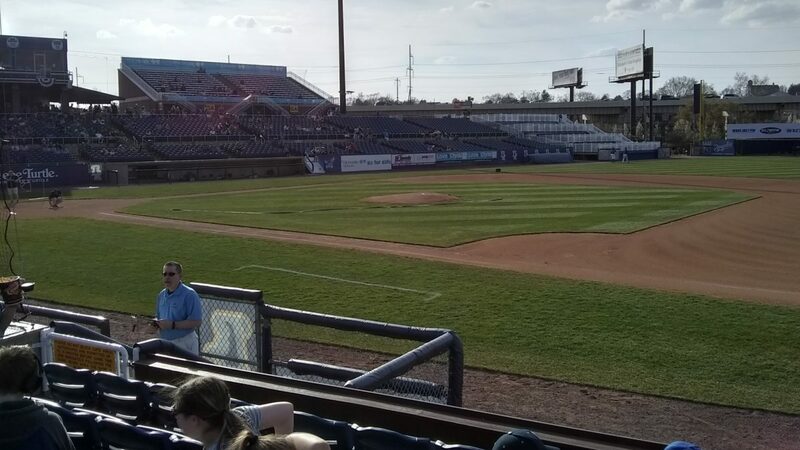 Plus, the outfield wall didn’t cut the stadium off from the world outside; from the third base side downtown Wilmington was visible, and from the first base side Amtrak trains and traffic on I-95 zipped by. I could see why the Binghamton Mets considered relocating to Wilmington a few years ago. 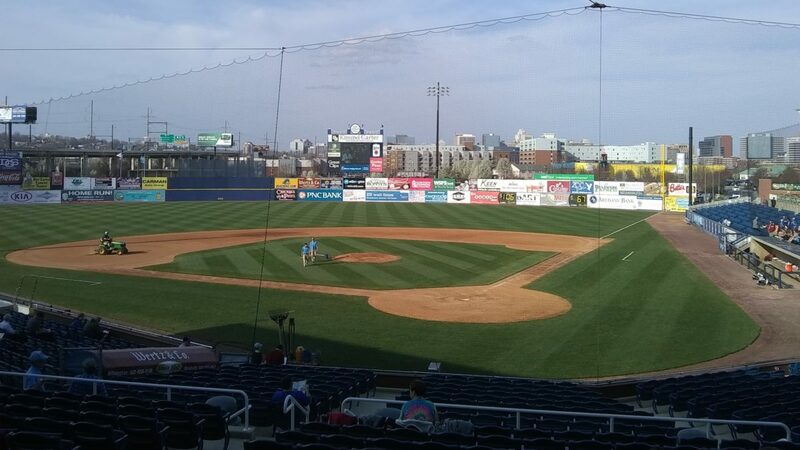 (The plan would have sent the Blue Rocks, a High-A team in the Carolina League to Kinston, North Carolina, with the AA Mets taking their place in Wilmington’s stadium.) The stadium was spacious and could seat at least 6,000, if not 7,000. Certainly it was the nicest, or second nicest, Carolina League stadium I had ever visited. The Star-Spangled Banner was performed by the Downingtown Area School District Fifth and Sixth Grade Band. (I drove through Downington every day to go to work at EB Games in Exton fifteen years ago.) The kids were not allowed to take their instrument cases into the stadium, though, a fact the parents I passed on my way into the stadium were grumbling about as they took the cases back to their cars in the lot. 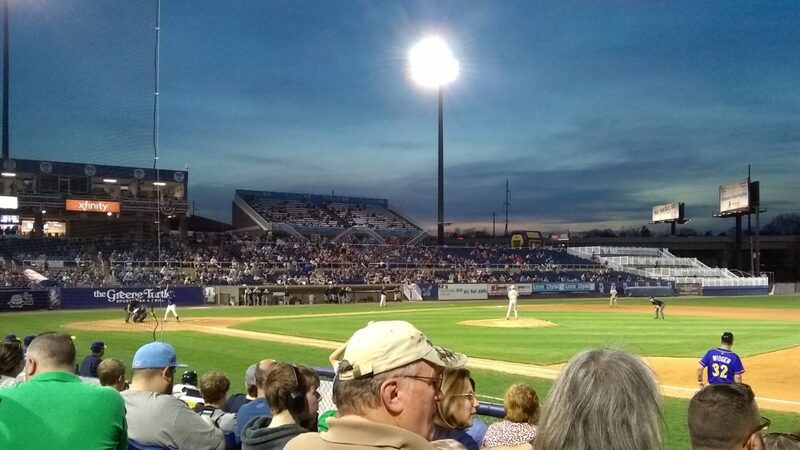 Overall, it was a nice evening for a baseball game, especially once the sun went down beyond the third base bleachers. Wilmington’s crowd was enthusiastic. Sometimes I can go to a minor league game and feel like the baseball is the least important thing happening there. I thought here it really was about the game, and the crowd went wild when the Blue Rocks finally solved the puzzle of Lynchburg pitching, clawed their way back, and took the lead and the victory. All in all, the Cecil County outing was a success. I explored four cemeteries and found some things, like Hugh Boyd and the Craigs at Principio, that may be fruitful. I visited ancestors who were really just names on paper and stood in places where people who had known them and loved them once stood. I visited churches where history happened and marveled at the artistry of carvings done two hundred and fifty years ago. I felt the weight of years, and marveled in the serenity of a spring’s day at the shores of North East River. It was a good outing, a necessary outing, and I felt like myself. I was searching for burial places of Gibsons and stumbled on your good work. Thank you so much; my wife and I are planning a visit to the Cecil County area this June and will visit the Gibson sites. From ancestry, your theory about the Craigs is correct as Mary Gillespie’s mother is Elizabeth Craig. The Craigs are an old and extensive family in Cecil County. As for the Hugh Boyd Gibson mystery, I’m sure he is similarly tied to the Boyds, Who have at least 3 generations of Hughs., but I haven’t been able to find the missing link. There are at least three generations of Hugh Boyds, also at least three of Hugh Gibsons. Somewhere there must be a link. Hugh Gibson didn’t drop down from the sky from nowhere. I have enclosed two stories retrieved from ancestry which might be interesting, if not pertinent. I have constructed family trees for Gibson , Boyd, Gillespie, and Craig, as well. Researched and written by Jimmy Locke Robert Gibson, or as some sources claim, David Gibson, was born 8 February 1699 at Six Miles Creek, Stewartstown, County Tyrone, Ulster Province, Ireland. H e married Mary McClelland about 1720 in Ireland. Mary was born about 1700 in County Donegal, Ulster Province, Ireland. Ulster, one of the four traditional “kingdoms” of Ireland, was only 20 miles across the channel from Scotland. Under an agreement with King James of E ngland, the lands “should be planted with British Protestants and that no grant of fee farm should be made to any person of mere Irish extraction.” So back in S cotland, with an ever increasing hardship due to the spread of a form of land tenure, called the feu, which had the eect of dispossessing many farmers of their traditional lands, a large migration of Scots travelled the channel to take advantage of the economic advantages of Ireland. However along with this migration came religious turmoil. Under the Jesuits the Irish people had become fervently Catholic and viewed the Protestants of Ulster as heretics and interlopers. A round the year 1717 the first of five large migrations to the Americas began. The first was touched o by a combination of a five-year drought, rack-renting, which means excessive taxation on our land and homes, a diminished trade in woolen goods, financial depression and religious discrimination and persecution. There were but two real drawbacks to coming to the Americas – the perils of an ocean crossing and the expense of passage. A long the time of the third migration, Robert and Mary came to the Americas in the year of our Lord 1740 along with their five children; Robert,18; Andrew, 16; John, 14; Israel, 12; and Mary, age 8. They settled on a plantation of their purchase in Lancaster County, Pennsylvania, two and a half miles below Peach Bottom Ferry, on the Susquehannah River. There, their sixth child, Hugh, was born. “ Like all Scotch-Irishman the Gibsons did things – great things – and followed the Dutch maxim of “Sage nicht und sie still” – say nothing and be quiet. In this they were unlike their “down east” Puritan neighbors who when they accomplished anything great or small told the world of it as a hen cackles about her newly laid egg, and those Puritans have been cackling ever since they stumbled onto Plymouth Rock. Scotch-Irishmen did great things and did them as part of their allotted work, and had nothing to say about them. R obert died 13 March 1754, at the age of 55, in Derry, Lancaster County, Pennsylvania. Aer Robert’s death, Mary is oen noted as the “Widow Gibson.” She and her family move to a place in the vicinity of Robinson’s Fort, nearly twenty miles from Carlisle, and at length, in consequence of danger from Indians, moved in 1756 into the Fort. On 1 July 1756, at the age of 56, Mary was killed in a brutal attack by Indians at Shermans Creek, Perry County, Pennsylvania. forward, one at a time, as we should be called. In this way we were all soon received and carried to Fort du Quesne, where our joy was such as may be better conceived than described. It was not long before we were all restored, like persons from the dead, to the arms of our relatives and friends. 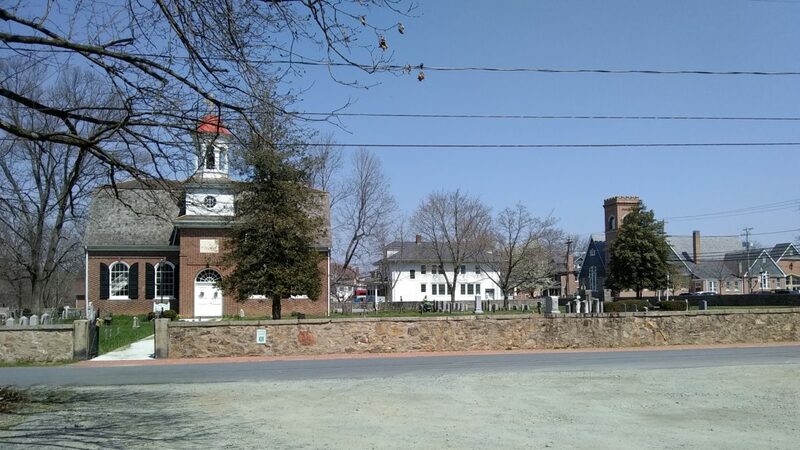 H ugh went to Lancaster County, Pennsylvania, where he spent two years with his uncle, William McClellan, and at the age of 21, on 14 June 1762, married Mary White , a daughter of the widow Elizabeth White. They then repaired to his late mother’s plantation in Shearman’s Valley, two miles from Robinson’s Fort. High withdrew, aer having wrought upon that place two years, in consequence of hearing that the Indians were intending to come and take him again into captivity, and lived in Lancaster County during the Revolutionary War. At the age of fiy-three years, Hugh moved to Plum Creek, on the Alleghany, and thence to Pokkety, Western Pennsylvania being free from all fears of Indian depredations. P er the 1790 U.S. Federal Census, the Gibson family was living in the Hopewell, Newton, Tyborn & Westpensboro, Cumberland Co, Pennsylvania area; Free White Males under 16: 2, Free White Males 16+: 2, Free White Females: 4. T he Gibsons settled, on the 17th of April, 1797, in Wayne township, Crawford County, seven miles below Meadville, on the eastern bank of French Creek, his p lantation comprising a part of Bald Hill. I n the 1800 U.S. Federal Census, the Gibsons were living in Meadville, C rawford Co, Pennsylvania; Free White Males 45+: 1, Free White Females 10-15: 1, Free White Females 26-44: 1. M ary died about 1820 in Wayne, Crawford Co, Pennsylvania. On 7 August 1820 the 1820 U.S. Census was taken, finding the Gibson family in Crawford County; Free White Males 10-15: 1, Free White Males 45+: 1, Free White Fe-males under 10: 1, Free White Females 16-25: 1, Free White Females 26-44: 1, Free White Females 45+: 1. H ugh died at the age of 85 on 30 July 1826 in Wayne, Crawford Co, P ennsylvania. M ary and Hugh had six children: Elizabeth, Mary, William, Andrew (1765-1828), Israel (your direct line ancestor), and Sarah (1786-). I believe we are related. My great grandmother was Mary Elizabeth Gibson who married in 1881 a blacksmith, Amos Whiteman. Mary and .Amos first lived in Farmington, Cecil County, later moved to Sylmar, Md although the physical location of their home and blacksmith shop was just a few yards away in PA. Mary and Amos’s youngest daughter, Mabel, married a neighbor, John J. Reynolds. They were my maternal grandparents. I understood from family lore that Hugh Boyd Gibson (wife nee Gillespie) were Mary E.’s parents but have never researched that family. Incidentally, one of John J.’s brothers was named Charles Craig Reynolds. Mabel’s brother Bill Whiteman took over his father’s business and I remember vividly our visits there. In fact, Uncle Bill used to make shoes for the horse my husband owned before we met. As a wedding gift my FIL had andirons made from them. We still live in the Nottingham, PA area and would be interested in exchanging information. 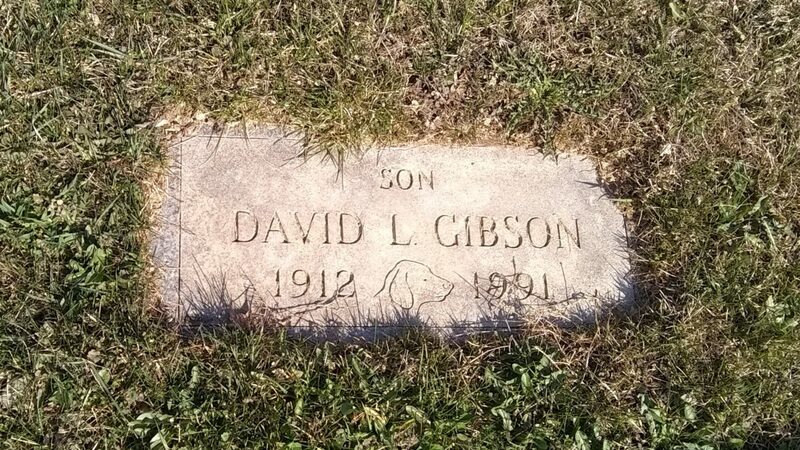 I also remember vaguely a distant relative of Mom’s named David Gibson who lived in Cecil County. He had a daughter named Ruth who was in the Rising Sun HS band with me. Both of us played clarinet.. We lost touch years ago. I have located the information Lydia Founds gave us before she died about Hugh (1818-1860) and Mary Elizabeth (1823-1857) and sketchy information about their 6 children. She has nothing about James other than his name, but included another daughter of Hugh’s and Mary Elizabeth’s named Providence (1846-1889) married to John Thomas Caldwell (1839-1913). Did you know about Providence? 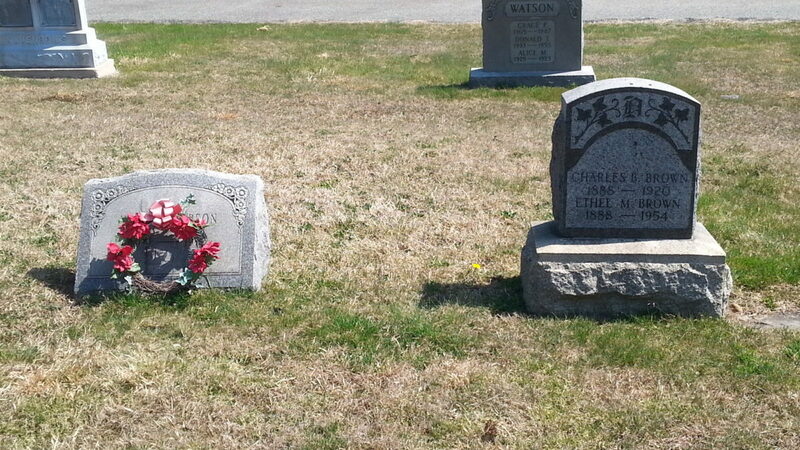 My gr-grandparents Mary Elizabeth Gibson (1855-1918) and Amos Whiteman (1855-1930) are buried at Hopewell. My mother said Mary Elizabeth died in the flu epidemic. They had 6 children. Somehow I lost the emails we exchanged earlier this month. Would you send me your snail mail addy so I can send you the information about my line if you are interested? It is not on a database on my current computer. Looking forward to hearing from you!